Thanks to my brother-in-law for letting me know that Mike Huckabee was interviewed on Fox News Sunday this past weekend regarding Governor Huckabee's presidential candidacy. 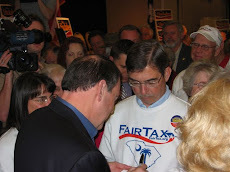 Click here to hear the interview where Governor Huckabee addresses Hillary's e-mails regarding Benghazi, the NSA bulk data collection of phone records, the future of Medicare & Social Security, & how the FairTax transfers power from the politicians to the people. The governor also provided a ninth grade civics lesson concerning the balance of power between the three branches of government as defined in the Constitution - specifically responding to whether or not he would obey Supreme Court rulings if elected president. Host Chris Wallace presented two gotcha examples pertaining to disregarding & refusing to obey Supreme Court rulings – 1) desegregation of Arkansas schools in the 1950s & 2) Nixon hypothetically deciding not to turn over the Watergate tapes in 1973 in defiance of the Supreme Court. The transcript of the portion of the program pertaining to the Supreme Court is below. WALLACE: Governor, I want to keep moving along, because as I say, there are a lot of things you said in your announcement. You also seemed to indicate that as president, you wouldn't necessarily obey court rulings, even the Supreme Court. Here you are. HUCKABEE: Many of our politicians have surrendered to the false god of judicial supremacy, which would allow black robed and unelected judges the power to make law as well as enforce it. WALLACE: But, Governor, we have operated under the principle of judicial review since the Marbury versus Madison case in 1803. HUCKABEE: Judicial review is actually what we've operated under. We have not operated under judicial supremacy. Presidents Lincoln, Jefferson, Jackson, presidents have understood that the Supreme Court cannot make a law. They cannot make it. The legislature has to make it, the executive branch has to sign it and enforce it. And the notion that the Supreme Court comes up with the ruling and that automatically subjects the two other branches to following it defies everything there is about the three equal branches of government. Chris, the Supreme Court is not the supreme branch. And for God's sake, it isn't the Supreme Being. It is the Supreme Court. WALLACE: But, sir, George Will, the conservative columnist, has pointed out that back in 1957, another governor of Arkansas, Orval Faubus, decided to disregard and refuse to obey the ruling to desegregate schools. President Eisenhower had to call in the 101st Airborne. Are you saying President Huckabee might decide he wasn't going to obey the ruling on desegregation, or like President Nixon to turn over the tapes? You know, it's up in the air as to whether you're going to obey the Supreme Court? 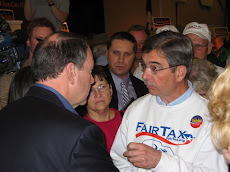 HUCKABEE: Well, Chris, as you know, George Will is no fan of mine. He's not very fond of me. He recently called me appalling. So, I'm not surprised he would make such a false comparison. But the point is, in that case, the Supreme Court had ruled the legislature and the executive branch had agreed with the Supreme Court, and precisely what happened is what should happen. The president ordered the airborne to come in and enforce the law, the law that did exist. HUCKABEE: It wasn't that the president defied the law. The president was carrying out the law and using all the forces at his resource to do it. WALLACE: But, OK, let's say the president decided, "I don't like the Supreme Court's ruling on that," let's say Nixon had said, for instance, in Watergate, "I don't want to turn over the tapes and the court can't make me"? HUCKABEE: Well, the president has to follow whatever the law is. Does Congress have a law that tells him what he is going to do? In that case, the Congress was ready to impeach Nixon and he ultimately resigned. I want to get back to the main point here. It's a matter of balance of power. If the Supreme Court could just make a ruling and everybody has to bow down and fall on their faces and worship that law, it isn't a law because it hasn't been yet passed. Then, what if the Supreme Court ruled they were going to make the decision as to who was going to be the next president and save the taxpayers and voter from all the expense and trouble of voting, and they'll just pick a president? Well, we would say, "Well, they can't do that." Why can't they do it? They can't do it because it's not in the law. We are sworn to uphold the Constitution and law. And it has to be consistent and agreed upon with three branches of government -- one can't overrule the other two. That's all I'm saying. We learned that in ninth grade civics, but I'm convinced a lot of Ivy League law schools must have forgotten that simple basic civics lessons along the way. WALLACE: Governor Huckabee, as I said, an awful lot of interesting things you said in your own announcement. I'm sure a lot of interesting things you're going to say in this campaign. "We can't afford not to." – Susan Lee answering Stuart Varney's question on CNBC in September 2002 regarding whether or not America could afford to spend $87 billion fighting a war in Iraq - one year after the 9/11 attack on the American homeland by people who lived in caves in a country most Americans never heard of, could not spell the name of, or find on a map. Many headlines were written last week about Jeb's inarticulate dubious responses to the most obvious question he or his staff had to know would sooner or later be asked – regarding whether or not he would have invaded Iraq in 2003 based on "what we know now?" There are other variants of this question such as substituting "faulty intelligence" for "what we know now." But just how demeaning are these questions – why would we invade any country based on what is known to be faulty intelligence? To recap – Jeb answered the original question on Monday of last week in an interview with Megyn Kelly on FNC by saying he would have invaded Iraq in 2003 knowing what we know now. Jeb followed this up on Tuesday in a radio interview with Sean Hannity by saying he had misunderstood the original question but now that he seemed to understand the question offered no answer @ all. On Wednesday Jeb tried to lead the matter away from his brother & himself & instead toward BO's pulling the troops out of Iraq while saying that it is a disservice to those who lost family members by answering such hypotheticals. But by Thursday Jeb finally said he would not have invaded Iraq in 2003 knowing what we know now. Of course all of Jeb's Republican opponents jumped in by saying they would have had nothing to do with the Iraq war. Ted Cruz & Chris Christie @ least were able to answer the question in the context with which it was asked – but with no in-depth thought. Cruz said "now we know that intelligence was false, & without that predicate there's no way we would have gone to war" & Christie said "if we knew then what we know now. . . I wouldn't have gone to war." But what is it we know now that we didn't know in 2002? First, we now know that we should not have considered going to war with Iraq in September 2002 & waited until March 2003 to launch the invasion – taking these six months to explain why Iraq posed a national security threat to America in what amounted to political correctness pandering for approval to attack from every country on earth. During this seeking of approval period Saddam had enough time to hide or more likely transport out of Iraq every weapon we, & all of his people he had killed with them over the years, knew he had. If Iraq was such a national security threat to America how could we afford to wait six months to eliminate that danger once it was known? Background - On October 11, 2002 Congress passed a Joint Congressional Resolution authorizing war against Iraq (296 to 133 in the House & 77 to 23 in the Senate). This authorization of war contained 17 measures, nine of which had nothing to do with Iraq's possession of or intention specifically to use weapons of mass murder. Accordingly, it has always been an oversimplification to say that the Iraq war was fought because of Iraq's possession of WMDs – this view did provide an easy to understand but misleading talking point for journalists (both liberal & conservative) to take advantage of a poorly educated citizenry in forming a position prevalent in America today. Saddam had initiated & used an extensive biological weapons program against his own people in the 1980s with anthrax, botulinum, & aflatoxin advancing to the weaponization level for deployment. Following the Gulf War (August 2, 1990 – February 28, 1991) Iraq's WMDs were essentially destroyed but it is not farfetched to believe that in the following ten years Saddam had rebuilt the weapons he once had & then some. With all the anthrax scares (e.g., - anthrax laced letters to Congress) in the fall of 2001 who could feel safe with a Commander-In-Chief or other elected representatives @ the state or district level who thought we could afford to find out that Iraq was not a security threat to America especially after all the belligerence between the two countries over the years? Second, we now know, if we inexcusably didn't already know in 2002, that Sunni Muslims & Shiite Muslims have been antagonists for centuries with no end it sight – although they did work side by side in Iraqi villages with the tyranny of Saddam hanging over them. They also work together with Hamas (Sunni) & Hezbollah (Shiite) teaming against a common enemy in Israel – seems the enemy of my enemy is my friend is the dominant principle that takes precedence over religious differences. The point is that nation building in a country with such religious animosity & without a tyrant in control would never work. The correct answer to Megyn's question, not just for Jeb & the other politicians, but most importantly for America is that we need a leader who, knowing what we know now, would have invaded Iraq six months sooner than we did, would not have sought UN approval to do so, & would have returned our troops home once there was no perceived danger to America's security. Below is my letter that was published today in the WSJ responding to Hillary Clinton's plans to change the First Amendment so that politicians, such as herself, will be further empowered to "regulate the quantity, content, & timing of political speech" in the words of George Will's key note address @ the inaugural Disinvitation Dinner last month. This idea of Mrs. Clinton's was accepted without a whimper from the press, including the liberal press, which is at first thought surprising but not so much so when you think about it. The second thought that Mrs. Clinton's plan provokes is that the liberal media is not satisfied with the current arrangement in which there are alternative forms of information. But when you think about it, & it doesn't have to be too hard, the position described by Mr. Will is what is actually happening in America already. The First Amendment's guarantee of freedom of the press is the lifeblood of an unbiased media. The liberal media realize that total weakening of the First Amendment will not change their positions of support for Democrat politicians in any way, but will silence dissenting conservative voices. "We're more than 50% socialist. And I don't think we're getting our money's worth." – Professor Friedman speaking about America several decades ago. 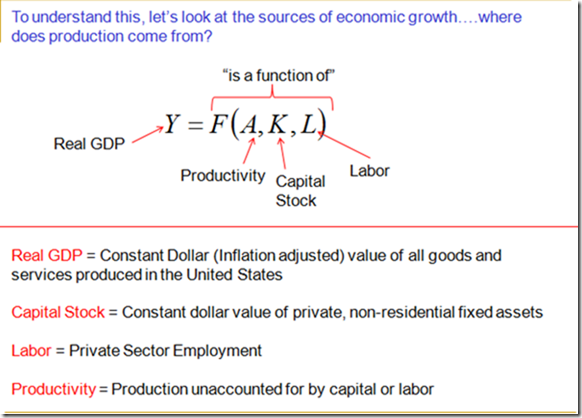 The above graphic indicates that the growth of an economy is a function of employment growth + productivity growth powered by capital investment. 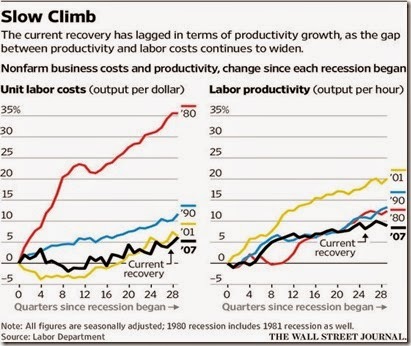 Unfortunately for America employment growth in good paying jobs has been almost non-existent since BO's deceptive misleading recovery started in June 2009 & nonfarm business sector labor productivity has also been stagnant during this same time, actually declining 1.9% during the first quarter of 2015 – see graph below. Median annual household income has dropped from over $54,000 in 2009 to under $52,000 in 2013 in inflation adjusted dollars - the only time that household income has ever dropped in an economic recovery – & in 2014 a third of Americans aged 18 to 31 were living with their parents – the highest percentage in @ least four decades. In addition, small & medium sized businesses are dying faster than they're being born. In short BO's plan of a lackluster existence under government dependence for "We the People of the United States" is working. 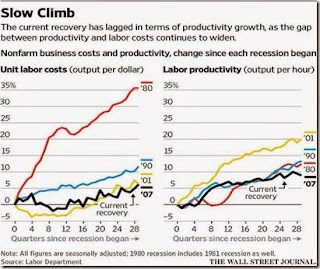 Job creation in April continued to inch along @ a tepid pace that ensures the American middle class will not return to strong prosperity anytime soon because the free enterprise system has been shut down by BO – hence another push toward socialism by politicians leading the general population in the wrong direction. There were 223,000 jobs created in April – 10,000 of which were government jobs. March's figure was revised down to 85,000 total jobs created – the worst showing in almost three years. This means there were 37,000 net jobs created when adjusted for growth in the labor force in April & negative 96,000 jobs net in March by the same measure. To put the jobs condition in perspective it took until June 2014 to get back to the same number of people working as when the recession began in December 2007 but the number of full-time employees is even today still 3.2 million below the peak of the fall of 2007. During the time of the recovery starting in June 2009 the working age population increased by 14.6 million people meaning these people were dispersed without a job into any one of several non-productive categories by the Labor Department. There currently are 93.2 million people of working age that are not considered part of the labor force. America needs a return to the free enterprise capitalistic system with emphasis on the word free. But far too few investors or companies of late are willing to risk their capital on expansions & innovations that will raise our standard of living because they face an Administration in BO's that has twice set the annual record by issuing 81,000 pages of regulations, & of course the American corporate income tax rate is the highest in the world @ 35%. Since 2013 BO has raised the top marginal individual income tax rate to 39.6% from 35%, added a 3.8% surtax on investment income, dividends, interest, & capital gains as well as an additional 0.9% Medicare tax on wages & self employment income – none of which will encourage business expansion. To put it another way – name one of BO's policies that ever would have helped the American economy? – of course there never has been one since his entire intention is to destroy the America most of us were fortunate enough to be born in. It is hard to find a politician in Washington who does not talk up a reduction in the corporate income tax rate – to be more competitive is the usual premise. But it is all talk after decades of such a charade. The corporate income tax rate is the highest in the world because politicians need money to fund their programs & think keeping this rate high is one of the better ways to get it. For instance, if the U.S. pays 25% corporate income tax in France there still is a 10% tax liability if this money is ever returned to America. Reduce the corporate income tax rate to 25% & you eliminate this additional liability. What a pitiful game & poor economic reasoning. The results of the survey below verifies the problem small business owners see with taxes & regulations as a stifler of business expansion. If you find your way of life & future livelihood evaporating in front of you look closely @ this graph. The above graphic indicates that the "quality of labor" is fourth on the list meaning that many businesses are holding back on expanding because they can't find workers with the skills to sustain the expansions. When people do not take the initiative to educate themselves so that they can compete with robots or people in third world countries who make pennies a day the result can only be disastrous for all such people in the global economy. In a reverse of the usual idea that companies send jobs overseas where they can pay lower wages than in the U.S. Senator Jeff Sessions points out that domestic companies gobble up the quotas for foreign applications for science, technology, engineering, & math majors not because there is a shortage of qualified Americans for these positions but because foreigners will work less expensively than home grown Americans in the same field. I can't dismiss this out of hand but if it is real it is part of the global economy in which companies try to maximize their efficiencies to the tune of 85,000 H-1B visas per year. It is @ least partially believable. 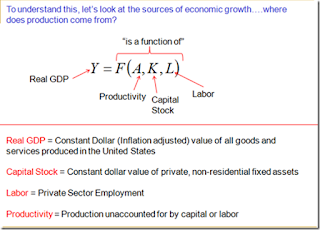 The above presents the economic problems the country faces. The political problem we face is that a majority of people believe that wealthy individuals & corporations are not taxed enough, a higher minimum wage is needed, & progressive policies like prekindergarten & government legislating paid sick leave allotments to companies are required in order for their lives to improve. This class warfare is heightened because every Republican proposal for economic growth calls for lower tax rates somewhere along the line & this completes the circle back to the statist talking points claim that Republicans favor millionaires & billionaires by giving tax breaks to the wealthy. See graphs below. 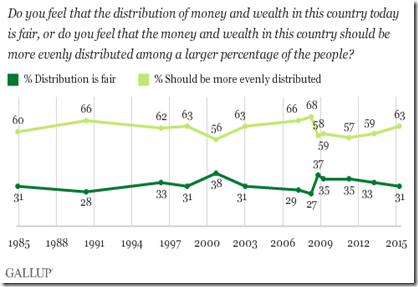 The graph on the above left shows that Americans have had a consistent socialist instinct for the 30 years surveyed as Professor Friedman stated above. 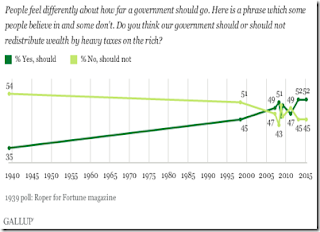 The graph on the above right shows a narrowing of free enterprise reward instincts over the decades & a clear shift to socialism the last four years in another sign BO is winning. People of substance discount this information @ their peril. Hillary Clinton senses the trends shown on the graphs & has already started to campaign to the left of BO because she doesn't want Sanders or Warren to steal the Democrat nomination from her like BO did in 2008. The Republican candidates for president, with a clear lack of leadership, are waiting to find out the most politically correct stance to take on issues like immigration instead of just telling people what they really believe – it is Mitt all over again. In 2008 there were legitimate reasons from A to Y why BO should have been defeated but Z was for zero – "which is the likelihood that one of the current GOP hopefuls will defeat BO in 2012." It is the Death Of Democracy principles once again that are coming forth to dominate our futures & that is why we need a Washington, Monroe, Coolidge, or Reagan figure to come forth. 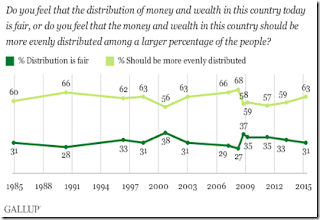 The majority of people are interested in handouts – not the workings of the Clinton Foundation or Hillary's bogus private e-mail server no matter how legitimate an issue these points might be. Ayn Rand said "I worship individuals for their highest possibilities as individuals, & I loathe humanity, for its failure to live up to these possibilities." Miss Rand also said she wrote about men like John Galt & Howard Roark because she knew they existed. Well, we obviously need them now & they can't appear soon enough to suit me. Thanks to a long time subscriber to RTE who specializes in these types of messages for sending the subject math trick below that is able to hone in & discover your all-time favorite movie based on a few simple mathematical principles. Please let me know which movie it determined for you & if indeed it is your favorite. Please do not look @ the list of movies before doing the math. The determination of the movie was easy – the quiz is to explain how the math trick worked. I will post all correct answers & send the solution to anyone who requests it if no one figures it out. DO YOUR math, write the numbers down, then compare the results to the list of movies at the bottom. You will be AMAZED at how true and accurate this test is.